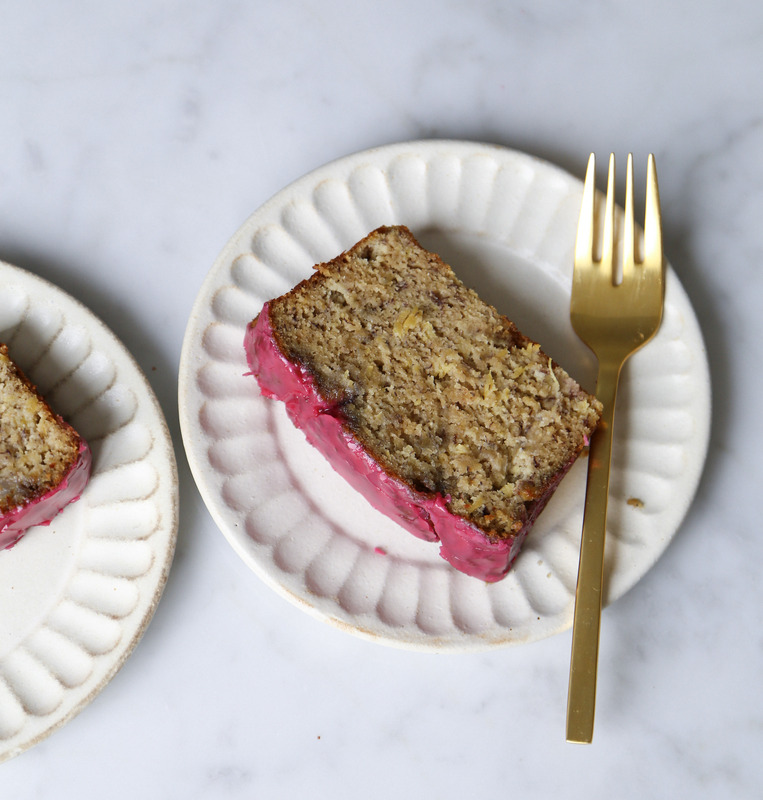 I’m clearly not over my Maui high because I’m sharing another recipe that I dreamed of on my vacation, a Hibiscus Pineapple Banana Loaf. A must do tourist activity in Maui is the Road to Hana. It’s a full day road trip, where you take a scenic drive on a very curvy, slightly scary, one way highway to see some of Maui’s most beautiful parks, waterfalls, and views. Prior to the trip no one told me that it’s basically a road trip for some of the most delicious food on the island. The waterfalls were nice but the multiple food stands selling banana bread is what really excited me. I couldn’t wait to come home and make my healthier grain-free version of pineapple banana bread. Another takeaway from Hawaii was dried hibiscus. They are flowers often used in cuisine for its beautiful colour and tart berry flavour. One sip of a hibiscus cocktail at Mama’s Fish House (a must if you’re in Maui!) and I knew I needed to experiment with this flavour. 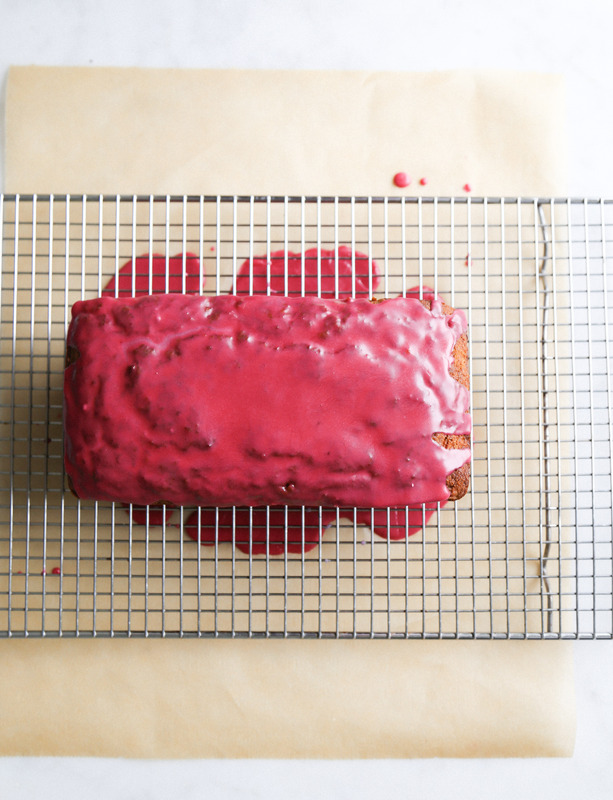 I decided to make a hibiscus glaze to top off the loaf. It definitely elevates the loaf with its gorgeous pink hue. I like to eat pretty. I ordered dried hibiscus flowers from Amazon because they were difficult to find. If you live near a Caribbean market I’m sure you can find it there. Also, instead of pure dried hibiscus flowers you can use hibiscus tea. Finding a tea that is purely hibiscus will be tough but don’t sweat it. Get any hibiscus tea combination that you want. With the sweet glaze, this loaf can be served as a dessert. Or, you can omit the glaze and enjoy it as breakfast bread. Do what you want with it! For those who celebrate Passover I’m pretty sure this recipe would be kosher since it is grain-free. Also, since Easter celebrates colour, it would also make the perfect Easter dessert. Preheat the oven to 350°F. Grease loaf pan and line two sides with parchment paper with overhang for handles. In a large bowl, whisk together the coconut oil and sugar until fluffy. Whisk in the pineapple, banana, eggs, and vanilla. In a separate bowl whisk together the dry ingredients. Fold the dry ingredients into the wet ingredients. Pour into prepared baking pan and smooth the top with a spatula. Bake for 50 minutes, or when a toothpick inserted in the middle comes out clean. Cool in pan for 15 minutes. Remove cake from pan and cool completely on a rack. Let cool before glazing. While the cake is baking begin the glaze. Steep hibiscus leaves or tea in 1/2 cup boiling water. Steep until very dark in colour, about 20 minutes. In a large bowl whisk together powdered sugar and 1/4 cup concentrated hibiscus water. Allow glaze to thicken slightly before pouring on to loaf. Enjoy once glaze has set. This entry was posted in Dessert and tagged banana, bread, breakfast, cake, dessert, gluten-free, grain-free, hawaii, hibiscus, maui, pineapple, Travel. Bookmark the permalink.